Sometimes, when you're sitting in the West Wing on a Friday afternoon, and the morning's torrential spring downpour parts like the Red Sea, and sun starts spilling out into the Rose Garden, you're like, You know what? #TGIF. It's burger time, boss. 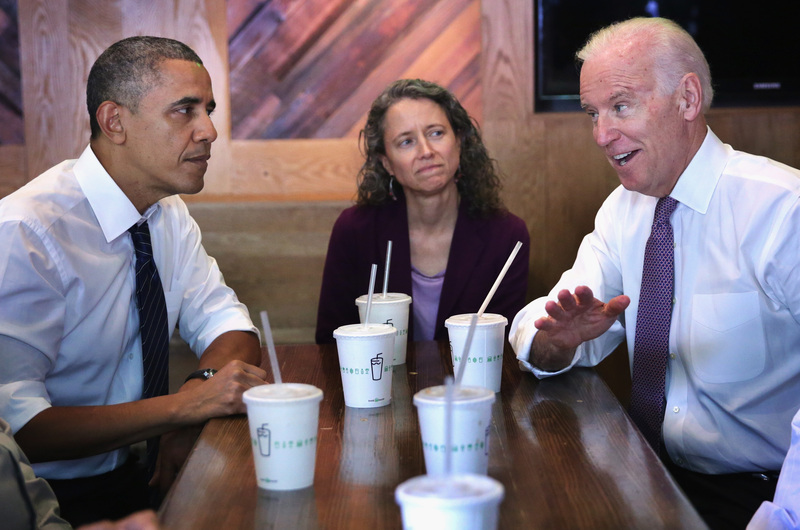 And that's probably how Vice President Joe Biden convinced Barack Obama to stop by a Shake Shack in DC's Dupont Circle for lunch. Presidents and vice presidents: They're just like us. They really wanted burgers. And shakes. And fries. Fire up the motorcade; it's Shake Shack time, bros. The biggest takeaway from Obama's burger-'n-fries choice is what it did not include: a milkshake. Shake Shack is named for its delicious shakes, meaning Obama reined himself in on Friday. He was still splashing out, though; the man's been known to occasionally order turkey burgers in DC burger establishments, a small form of blasphemy despite the fact that turkey burgers can be tasty. Anyway: The lack of a shake says Barack Obama is married to Michelle Obama, the American champion of healthful diets. This is a picture of Joe Biden slurping down his delicious shake, which was the whole reason he was craving Shake Shack, probs. Joe Biden's choice to get cheese on his burger AND a shake probably indicate that he is not married to Michelle Obama, the American champion of healthful diets, and may also be an indication of his East Coast roots, where the "black-and-white milkshake" reigns supreme. It's Friday. Go eat a burger.